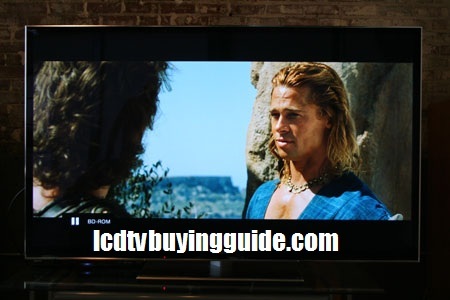 There is also a Panasonic TC-P65VT60 65 inch size and an TC-P55VT60 55 inch version. There is a PN51F8500 (51 inch) and PN64F8500 (64 inch) Samsung sizes. 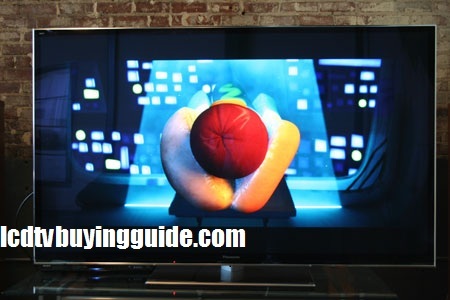 For this review we tested the 60 inch sizes. We thoroughly enjoyed reviewing and evaluating these two exceptional TVs which share top quality ratings on our site among all TVs, not just plasma TVs. Both have exceptional picture quality performance and feature attributes. We hope this comparison is useful to you. This category is normally won by Panasonic for the past couple of years. But the F8500 has better light flow-through than the VT60 and wins this. It's actually a slight bit better for bright room performance. Obviously, calibrating the TVs is very important and we were happy with the performance of both during and after calibration. Coloration is certainly distinctly different for these two. The Panasonic has a more blue tint, while the Samsung's warmer tones can turn a little green. It's just preference. The Samsung probably has closest to cinema type picture, but the Panasonic can have richer color at times. They are both great. Both of these TVs tout some of the strongest black levels in the market. Many reviewers and reviews hang their hat on black levels and contrast because it can be measured with post calibration measurement the key. It is certainly important though, rich dark deep black levels make the colors pop. Both have great black levels with the VT60 barely edging out the F8500. Love the picture quality on both. It's the VT60 by a slim margin. Both TVs use active 3D glasses and both have a great 3D picture image, though not as good as the passive 3Ds from LG and Sony. We'll give it a draw even though the Panasonic VT60 took more picture setting adjustment to bring out a great picture. The Samsung PN60F8500 touch pad remote is more sophisticated in its touch pad, voice recognition capability than Panasonic's. It does lack some buttons like an aspect ration button but it covers most everything now, even input. It helps speed navigation and browsing more than Panasonic's hockey puck touch pad addition. The menu systems of both TVs are great, but we like the settings tutorial on Samsung's. While both Internet browsers work well, we felt the Samsung remote (touchpad and voice recognition) helped a bit more with speed. Samsung in the past had a clear advantage here, but not anymore. 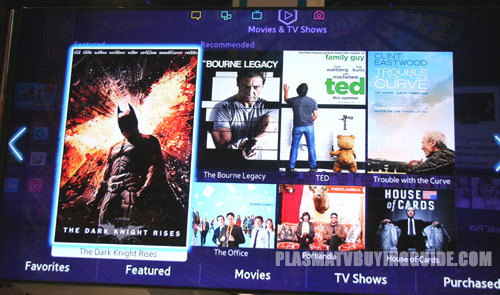 Panasonic's Smart TV Apps are among the fastest loading, and are easy to display. Lowly standard definition signals are still prevalent, and TVs need to be able to process and up-convert them well. The F8500 really does a great job with this although the picture is much dimmer. The Panny also does well, especially with 480p signals, but not great with interlaced 480i. Both of these plasma TVs have questionable performance when it comes to gaming. Input lag is one of the main concerns for gamers and both TVs clock in at about 80ms with the Game Mode enabled. The F8500 handles judder and motion blur better in Game Mode (No Motion Judder Canceler or other picture features), giving it the win. Both TVs have a framing bezel of an inch or so so are not the frameless window type design seen in many top end LED TVs. Attribute this to the plasma panel. Both are metal, and look classy. I like the VT60's V-shaped stand more, and the jet black screen when turned off. I like the glass and metal design on the Panny a little more as well. Both TVs have a built in pop up camera for Skype, both have gads of picture features. The motion hand control feature on the F8500 is something you probably will not bother to use except as a novelty so we'll call this a toss up. Samsung's voice control feature works better but we cover that under the remote control and browsing categories. 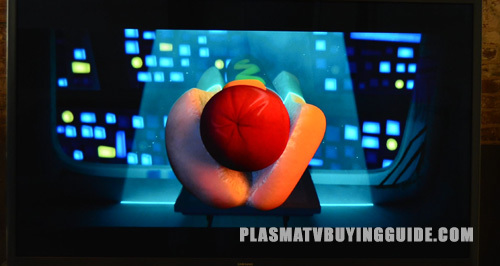 Reports of Samsung plasmas going bad too early required some investigation. We contacted a couple of extended warranty companies and verified. 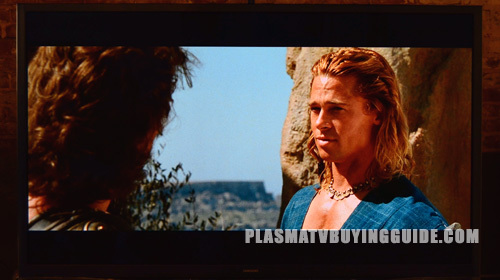 Panasonic plasmas have good to avg. reliability over time. While the F8500 may not have the same issues as some of the past models (particularly C-series), Panasonic is the winner by past experience. The Samsung F8500 had a slight buzzing noise when you get real close. I hate price collusion and this reeks of it. Both TVs cost $2799 as of this writing. Maybe it's just price matching by one or the other, let's hope so. 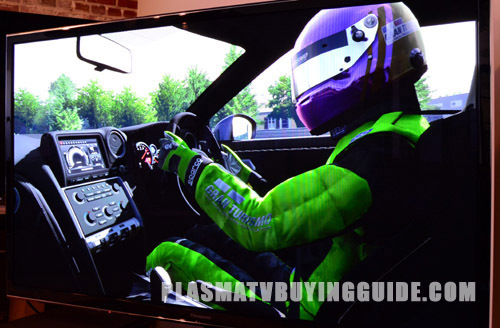 The 65” Panaasonic TC-P65VT60 costs $100 less currently than the PN64F8500 at around $3299, but that could change tomorrow.